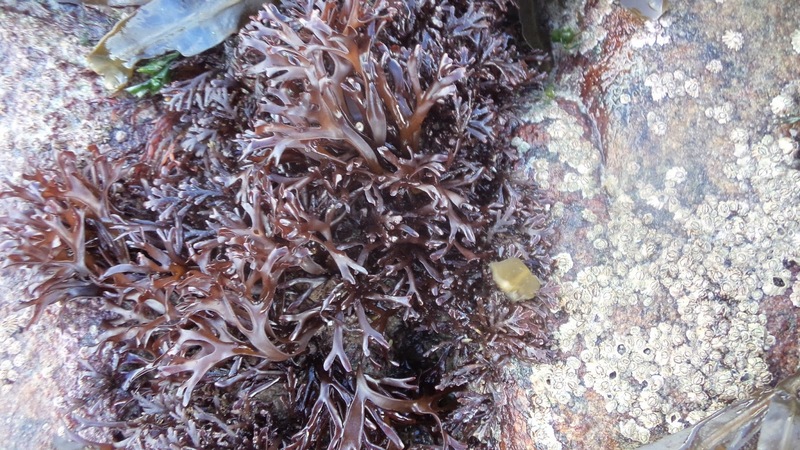 Carrageenan is one of the smaller marine algaes. It ranges in colour from purple, brown to yellow and grows in clusters on rocks or in pools on the lower shore, where foragers can pick it at low tide. Subtidal plants tend to be larger with thicker blades. Carrageenan has colloquial names and the spelling of these vary, so for safety, stick to the Latin Chrondus crispus. Carrageenan is the EU regulation spelling.If you buy it in a shop you have a choice between: Iota, Kappa and Lambda. A vendor selling plainly labelled “Carrageenan” or “Irish Moss Powder” is likely not to be the Iota variety because Chrodus crispus is said to be made up of kappa and lambda.Natural carrageenans occurring in iota, kappa and lambda are very difficult to separate and so, I have to suggest raising a question mark over standardisation, which will vary from mixture to mixture, depending on what the carrageenan is to be used for. Fortunately I forage carrageenan and so, my life as a home cook should be much more straightforward, or is it? I often find that I need to use more carrageenan to encourage a dish to ‘set’ than on a previous occasion and I can only think that this is down to variation within the species or perhaps, the time of year that I’ve gather the carrageenan. Who knows, I am not a scientist but I do cook with it on a regular basis.I live on an Outer Hebridean Isle so carrageenan is readily available and definitely more accessible to me than leaf gelatine.My amateur advice is not to measure the dried grams, as cookery books direct didactically but to measure the cooked gel in tablespoons: Rehydrate foraged and dried carrageenan, put it in a pan, cover with water and then simmer for about 15 minutes. Strain the resulting thick, gelatinous gruel and have a good look at the gloop (which is rather clever and will, unlike gelatine, set at room temperature). The experienced cook will soon learn to work out the quantity of strained brown gel that is need to obtain a wobbly or solid set. When dried, carrageenan shrinks to nothing and is extremely light.When a recipe calls for 25grams, it will make a large dent in your store cupboard supply.On occasions when I've cooked with fresh carrageenan, I've found that I needed to use significantly more to ensure a decent set. Food scientists use carrageenan to thicken : e.g. in ice-cream and marshmallows, to emulsify i.e. to stop liquids separating in cheeses, to change food texture that is to make something chewy or to prevent sugar crystallising.Carrageenan used commercially has not one but two E numbers. The home cook can use carrageenan in puddings, savoury mousses and as a thickener in stews, soups and gravies. 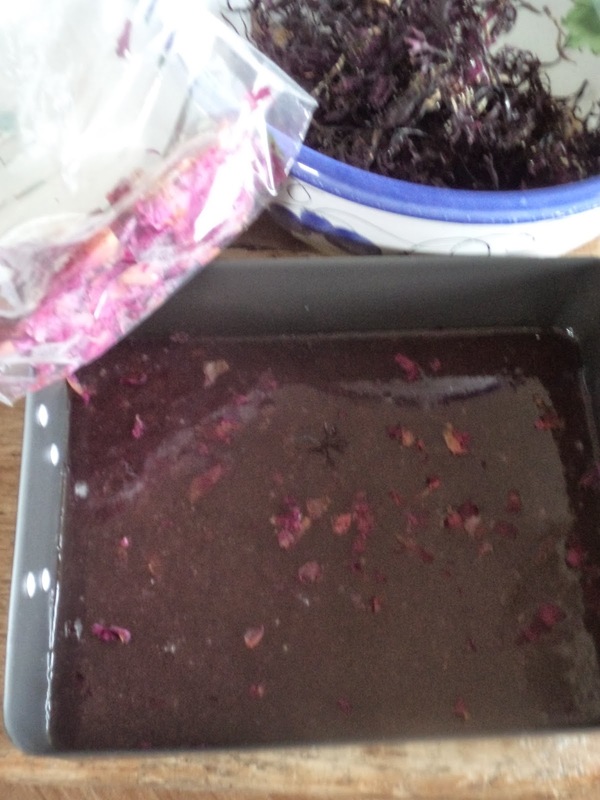 In confectionery it has the benefit that unlike gelatine, it is not of animal origin.I’ve made rather good fudge with it and something similar to Turkish Delight, which I flavoured with Rosa rugosa. Although deemed to be an invasive species the birds, butterflies and bees seem to like Rosa rugosa. 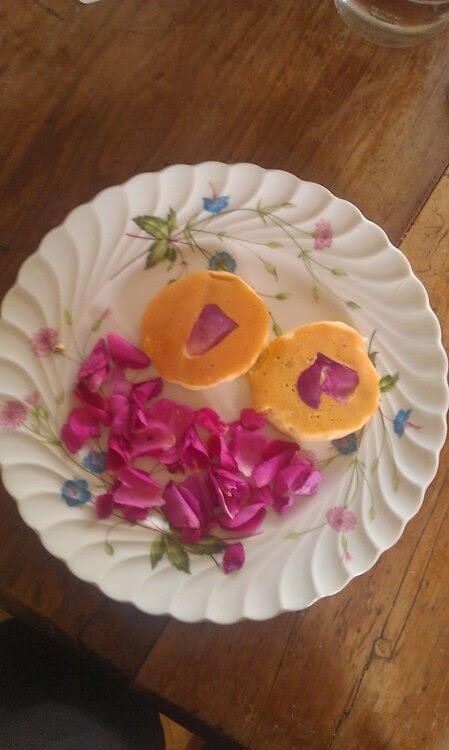 If the scented petals are picked on a sunny summer's day, brushed to free visiting insects and then, tightly packed in zipped freezer bags, they can be used in the kitchen at a later date. Opening the bag unleashes colourful, scented summer memories but a word of caution, less is often more from a culinary point of view. I am indebted to Iain McKellar from Just Seaweed for this wacky recipe idea. 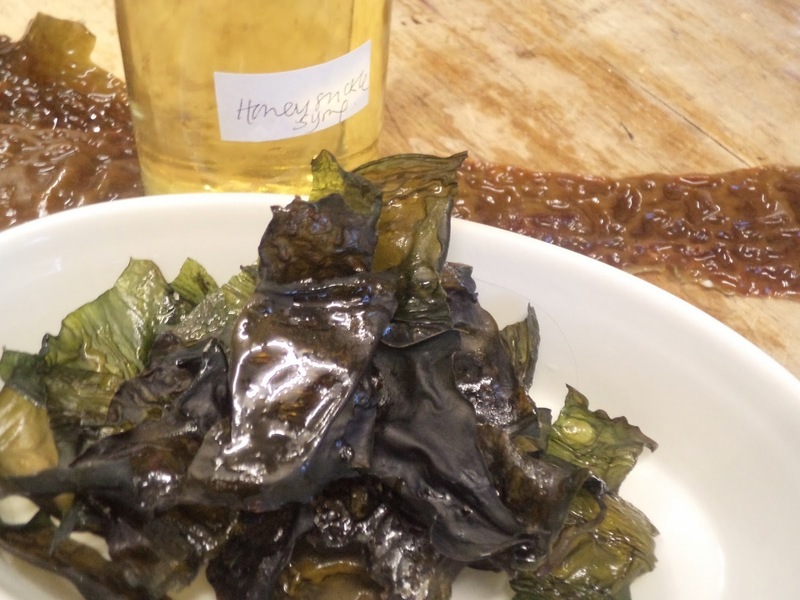 He happened to mention that a Chinese client purchased sugar kelp, coated it in honey and made crisps.Recipe creation is rarely 100% original and immediate seasonality may thwart the exact reproduction of this moreish nibble, until sunnier times. Fortunately, I had a bottle of 2013 Honeysuckle syrup in my store cupboard, which enabled me to make honeysuckle kelp chips on the dreariest, wind swept Outer Hebridean day.The Scots word dreich sums my day up beautifully but the consumption of the kelp crisps definitely sweetened it. 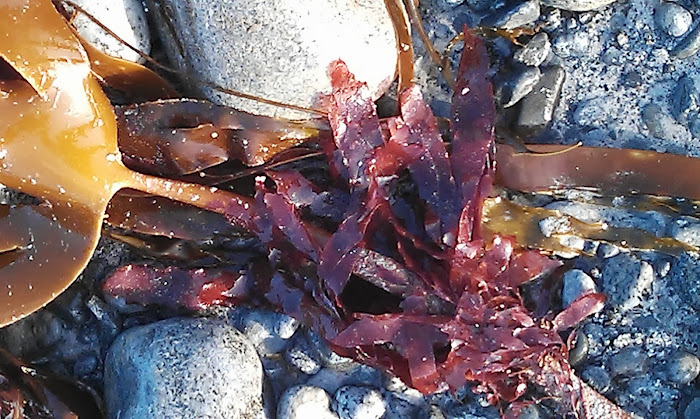 When you reach the final stage of writing a book, the very last thing you need to hear is that 'somebody' has written a very decent book on the same subject... after a very long walk on an Outer Hebridean beach, where I exhausted my chagrin by pulling dulse from storm-wrecked tangle, as it glistened in the late autumn sun; I mustered up the courage to order Sally McKenna's Extreme Greens, Understanding Seaweeds. It is a stunning book. The food and marine algae (species ID) photography is breathtaking and the recipes are oceans beyond sushi. Sally is a forager, and a lady who creates recipes, which tempt my taste buds. I have long laid claim to the invention of a cordial made from rhubarb (which is, of course, pure hubris; much in the same vein that Richard Mabey notes a simple blackberry junket, which Dorothy Hartley had previously penned in 1934) but I digress.. In The Forager's Kitchen I mix rhubarb with sweet cicely to make a smoothie and in her book, Sally adds sugar kelp and ginger to rhubarb for cordial. Her inclusion of seaweed in the recipes is very subtle, as any seasoned, seaweed cook will already understand. 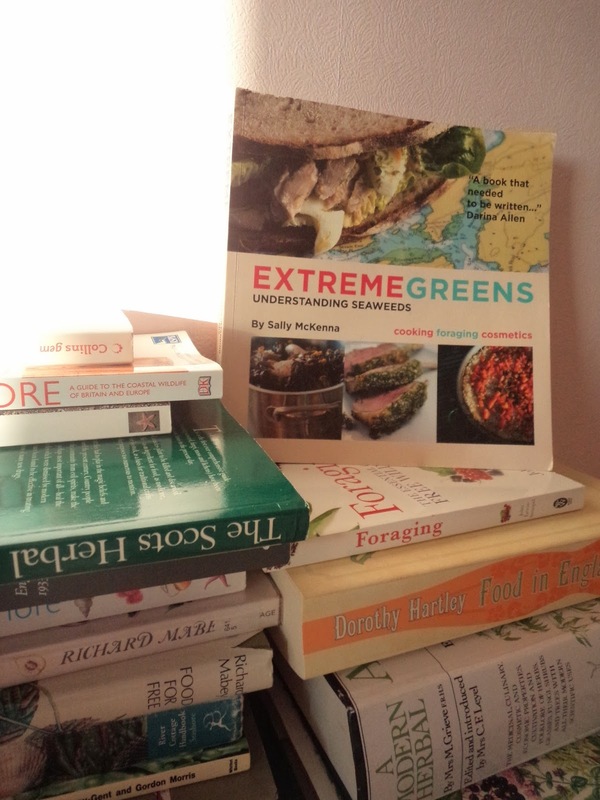 Seaweed hasn't just been added to justify adapting a recipe to a 'seaweed book'; nor does she use seaweeds,which don't work well in the kitchen.This book cudgels a challenge for the inquisitive but novice, marine algae cook and there is plenty for the more advanced phycologist too. Sally's book begins with some seaweed chat relating to identification, relevance of the moon and tides, harvesting, drying and storing. It's a comprehensive introduction. The recipe section of the book is extensive and there is beautiful photography for those cooks, who need to know exactly what the finished dish 'should' look like. There are also sections on cosmetics, foraging and even making sea salt from scratch, which rather unsurprisingly, Sally and I do in much the same way. I've already asked if I can 'borrow' her seaweed oven recipe for my book. Sally is a real kindred spirit and I have not only enjoyed reading but learnt from, her book. I purchased my book direct from John and Sally Mckennas' Guides ' website, where you will also find out about all the best places to eat, shop and stay in Ireland. I recommend buying this book, especially if you live near the coast. Darina Allen said of it, "A book that needed to be written." Indeed it did, but I am praying hard that one day, there is a small corner for another, albeit rather similar book on your bookshelf too .